SWS Company does not set any operation time-limits or number of jumps for the container or the harness. Successful check-up by a competent rigger is enough to provide permission for the further use of parachute system. SWS Company requires to check up the system at process of assembling, every time before packing the Reserve (whether the equipment was deployed or not), after cases of suffering adverse conditions (for example, after soaking in water), and regularly – once in 6 months if the regulations of country where the equipment is used do not say otherwise. 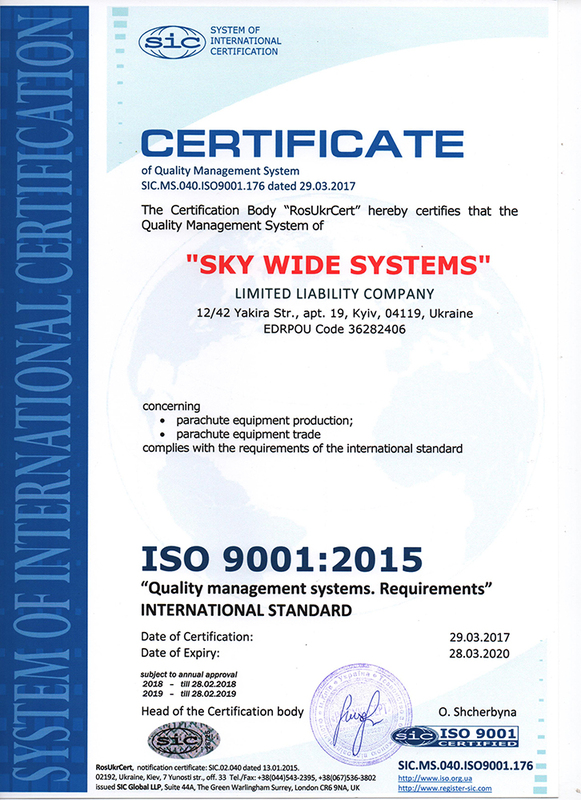 SWS Company has successfully passed the certification for compliance the quality management systems requirements ISO 9001:2015 “Quality management systems”. Notification certificate SIC.MS.040.ISO9001.176 dated 29.03.2017. 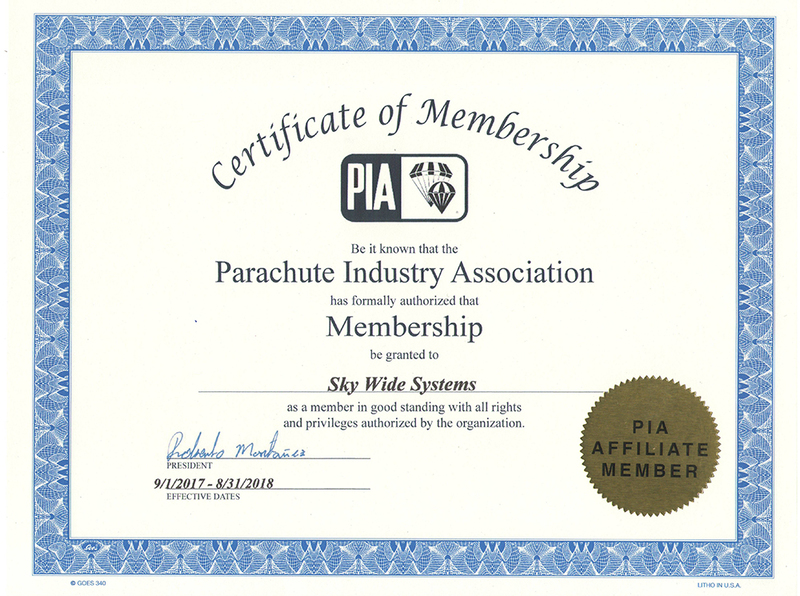 In 2017 SWS company has reinstated membership at Parachute Industry Association (PIA). After having completed our Fire container design we were planning to obtain the most exact certificate of those that were available at that moment, which was TSO-C23d that could provide the access to the biggest market of the USA. Considering that fact that the program of dropping/jumping tests was exceeded almost twice we did not expect any general issues. We contacted the Aircraft Certification Office (ACO) of the Federal Aviation Administration of the USA (FAA) and initiated the process of TSO obtaining. - System of quality control, outgoing control, and the tracking system of the materials employed. After having initiated the procedure of the certificate obtaining we provided the gear to be analyzed, test protocols and the completed list of manufacturing documents. After the materials were approved an issue of manufacturing certification was brought up. There is a bilateral agreement between FAA and local aviation administration regarding the transfer of authority of manufacturing control to the local aviation authorities. 3. There is no any bilateral agreement. Thus, TSO obtaining for a manufacturer located in the Ukraine that managed to meet all the test requirements and provided all the necessary documents is not possible. We may play a trick by establishing a subsidiary company in a country where manufacturing certification can be obtained and perform the final assembly there in situ. This is what was done by PD by commissioning the manufacturing in Honduras but they perform the control inspection and lines installation in the USA. But this is the American company with production located in the USA and with totally different facilities and budgets. An attempt to do that is not so advantageous for a foreign manufacturer: after having provided all the formal documentation it may be possible to obtain TSO. However, should FAA have any doubts in validity of manufacturing on the controlled territory TSO may be withdrawn. This can cause some disturbance among the consumers of this type of equipment if suddenly their equipment is banned for employment (this is what happened to a Slovenian manufacturer of lightweight aircrafts Pipistrel). After having considered the situation and possible results for our clients we decided not to take risks and to abandon our attempts to obtain TSO. At the moment we are in the process of the European certificate obtaining and the procedure is almost completed.